In my weaker moments, those moments when I have desired nothing so much as the comforting thud of an enveloped book arriving through my letterbox, I have come perilously close to signing up to a subscription with Fitzcarraldo Editions, a publishing house for which I have a deep admiration despite having not read any of their books. Some time ago I must have signed up for their newsletter, and now and again an e-mail thuds comfortingly into my inbox and I read it with an indecent level of covetousness, lingering over the description of the latest book which, invariably, suggests immediate purchase is necessary. There’s just something about the kind of books that Fitzcarraldo publish that resonates like a harp in my soul. And despite all of this, despite my finger lingering over the 12 month subscription button on more than one occasion, despite a back catalogue filled with books like Second-hand Time, Pond and Zone all of which I would read in a heartbeat, I’ve never yet succumbed, though the temptation is like the promise of a hit of something craved and perhaps it is this temptation alone, the delicious thrill of it, which has held me back all along. Because a temptation fulfilled is less fun, in many ways, than one which continues to offer the anticipation of fulfilment, and in this way I continue to dangle that subscription just out of reach though the back catalogue, it seems, is perhaps still a temptation too far which is how Notes From No Man’s Land landed on my doormat. 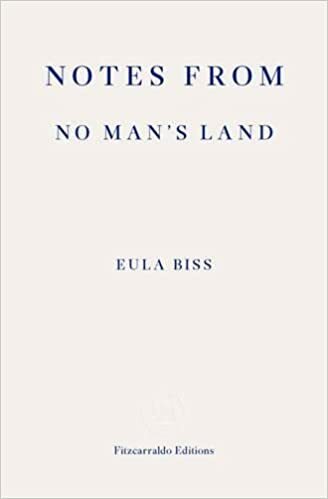 Notes From No Man’s Land is a series of essays concerned with the issue of race in America, identity politics (though Biss admits she doesn’t entirely understand what this is) and the disparity in the way the actions of white Americans are perceived compared to the black community. Yet that description itself is a whole lot less complex than the book itself is, and offers a certainty which Biss doesn’t grant through the essays. Because Biss is a questioner, a questioner and an observer and a wonderer and with her eyes open she sees injustice and inaccuracy and disparity wherever she looks. Starting with the question of race is in itself a complex point, as Biss explains with uncustomary absolutism – “There is no biological basis for what we call race, meaning that most human variation occurs within individual “races” rather than between them. Race is a social fiction. But it is also, for now at least, a social fact. We may be remarkably genetically similar, but we are not all, culturally speaking, the same.” – Biss begins in an unusual place, the invention of the telephone and, more specifically, the telephone pole. Here she explains the history of the development of the telephone, the wires that connect us and the extraordinary fact that we are all connected, and the way in which the march of the telephone pole was restricted and resisted by those whose property they crossed. This exploration morphs into the use of the telephone pole as a vehicle for lynching black men, black men accused of, whether or not convicted of, harassing white women, or of stealing white people’s property or murdering white people. It’s a powerful parallel: the technology which is designed to connect us being used to rip communities apart. As Biss reflects, things are not innocent. In these times of ‘fake news’, of 24/7 coverage of events like the Manchester and London attacks by the mainstream media who simultaneously barely report the bombings in Afghanistan or Iran, we would do well to remember that these are some of the stories but not all of the stories, and that there are other stories which demand both our outrage and attention and which we will never see, not because they don’t exist but because they don’t reinforce the narrative that those in power want us to hear. And what Biss does, in this powerful collection of essays, is remind us to listen, because she listens, and not just listen but really think about what these stories are telling us, because narrative is rarely simple and listening is really hard and now and again we need to be reminded of that. I was glad to receive this timely reminded, through a series of essays which are intelligent and balanced and generous, at times amusing but always thought-provoking. And Biss shows a kind of mental flexibility which is both admirable and inspiring and I found myself wishing we could all be so willing to examine the issues we face with such honesty and humility and so penetratingly. I’m glad that my moment of weakness led me to these extraordinary essays and that my faith in Fitzcarraldo was not misplaced. I think that back catalogue might turn out to be too tempting after all. This entry was posted in essays, non-fiction, race. Bookmark the permalink. This sounds like a very thoughtful and thought-provoking collection, well worth giving into temptation. It certainly was Susan, a very interesting read. I have placed an inter-library loan request for this book and look forward to reading it and exchanging a few thoughts with you. As for yielding to temptation, given you live in the land of Pooh, I’m happy to characterize this read as honey on the toast.